OH crap! I didn't even know Deborah Kerr passed away until I read NYPost's Cindy Adams last night. It was such a busy week what with the G2 bombing and all. 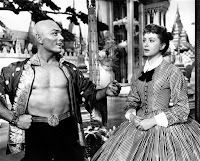 Deborah Kerr was such a fine actress who held her own against the brilliant and supersexy Yul Brynner in my all-time favorite movie "The King and I." As Anna Leonowens (did I spell that right? ), Kerr was every inch the lady that charms, and at that same time, befuddles the King of Siam. She was such a delightful governess to the King's children, everyone I knew when I was growing up wanted to have a yaya like her. She sings! She dances! She bites the head off the King! Wow! Some may not know that Kerr was actually trained as a ballet dancer and had Margot Fonteyn as a classmate. If you've seen Margot Fonteyn dance during her prime (she visited Manila decades ago, btw), it was only understandable that Kerr felt she couldn't hold up a candle to that. So she went on to become an actress instead. And what a good decision that was...Kerr went on to become a well-loved actress, starring in so many wonderful features like with the gorgeous Cary Grant in the unforgettable and weepy "An Affair to Remember" and even playing a proud Christian slave in "Quo Vadis." She never won any Oscar awards for all her best actress nominations but she was finally given an honorary Oscar in 1994. Although most of Kerr's movies were made a decade before I was born, they very much a part of my childhood. I remember eagerly waiting for "The King and I" or "An Affair to Remember" to be shown on TV in rerun after rerun. I'm such a sucker for romantic happy-sad stories. Read the tributes to this marvelous actress in CNN and The Independent. That beach where the scene was shot is a tourist attraction in Hawaii. Guides point to it as the place where Deborah Kerr and Burt Lancaster kissed. Hi! Have you seen "Heaven Knows, Mr. Allison?" Cary Grant may have been a dashing romantic lead, but I have to admit, no one could beat Robert Mitchum as The Man Who Could Hold His Own Opposite Deborah Kerr. Their chemistry positively crackled, which is funny because in the film, she plays -- what else -- a proper English nun, while he played a foul-mouthed American sailor. The ending has to be one of the most bittersweet and romantic finales of all time.